Not only is The Prince Charles Cinema probably my favourite film viewing establishment in London but 'The Princess Bride' is also one of my most loved films - making this "quote-a-long" screening almost destined for success. I imagine most of those attending felt similarly. It certainly proved to be a tremendously enjoyable experience for an eager audience, many of whom hadn't had the opportunity to see 'The Princess Bride' on the big screen. This wasn't just a screening. 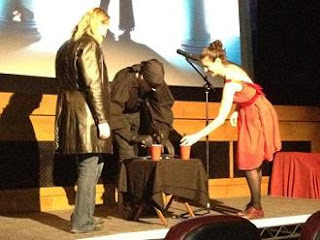 The cinema went as far as hiring their own version of the Dread Pirate Roberts to act as host - performed admirably by James Thompson. The preamble was an excellent opening to the evening with the costume contest proving somewhat hilariously one-sided when all but one contestant arrived as the Dread Pirate Roberts. Barring my brilliant 'Hook'-themed birthday party aged 7-ish, I have avoided fancy dress. But I doff my proverbial cap to those who made the effort! Similarly, volunteers were sought for a re-enactment of the Battle Of Wits to see "who is right, and who is dead". But including a selection of quotes from the scene, which proved hilarious. No-one died but DVDs were won. With the audience now suitably prepared, 'The Princess Bride' began. I'm not sure how much I need to tell you about the film - it is such a beloved film and well within the IMDB All-Time Top 250 list. Yet I honestly had never even heard of it until a couple of years back. Indeed, I remember noting the first time I ever saw the film on Twitter and received a flurry of replies simply stating "INCONCEIVABLE!" Baffling at the time but grin-inducing afterward. The film is framed from the perspective of a grandfather (Peter Falk) reading a book to his sick grandson (Fred Savage), entitled 'The Princess Bride'. Buttercup (Robin Wright) separated from her one true love Westley (Cary Elwes) and forced to marry the dastardly King (Chris Sarandon) against her will. Before that event can occur however, she is kidnapped by Vezzini (Wallace Shawn), Fezzik (the sorely missed Andre The Giant), and Inigo Montoya (Mandy Patinkin). The group find themselves chased by the mysterious Dread Pirate Roberts, who is not all he seems. For those unfamiliar with the film, it is not quite as wet as the title suggests. Yes, it is a fairytale, albeit more a homage or satire, about "wuv, twue wuv". But it so much more. Based on the William Goldman novel of the same name, The Princess Bride takes us into a realm of fantasy featuring fire-swamps and giant rats (and a real-life giant) with a quotability factor matching the immense 'Monty Python & The Holy Grail'. Each scene is played straight by the thoroughly excellent cast but with wit and charm lovingly doused over every element. Particularly with the glorious cameos from the likes of Billy Crystal and Peter Cook. It is a very special film, and this was a very special event - an appropriate 25th anniversary celebration for the film. To see one of the greatest comedy films of all time, as well as one of the greatest love stories, on the big screen was an utter joy. 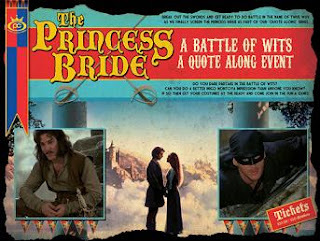 If you are yet to see 'The Princess Bride' then please seek it out, perhaps even at the Prince Charles Cinema, where another Battle Of Wits will begin anew on the 9th June. I may even pop/quote along again. For more info, head to princecharlescinema.com.